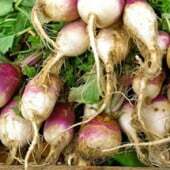 Turnips are quick growers, cold tolerant and yield greens that are delicious steamed (with a touch of vinegar). 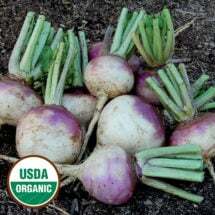 Rutabagas are larger and take a bit longer to grow but have a milder, sweeter flavor. Both are great for winter storage and delicious creamed with a little nutmeg. 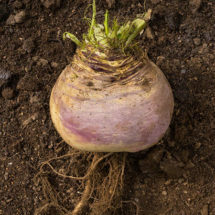 Plant heirloom root crops directly in the garden. 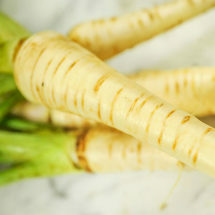 Tasty white roots with sweet, nutty flavor are best harvested shortly after frost. Very tasty, mild and sweet, great cooked or raw, bright yellow flesh, top quality. Large tops make delicious greens. Smooth white turnip globes are best for eating.